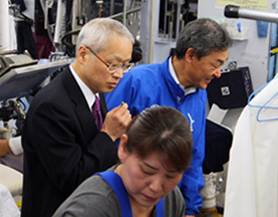 Kikuya has received the prize "High Service Japan Top 300"by SPRING in 2008 and "40th JIIE Literature Award"by THE JAPAN INSTITUTE OF INDUSTRIAL ENGINEERING by in 2011. 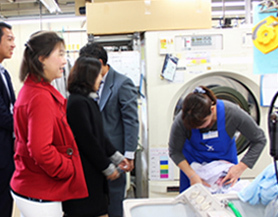 We think that people from may research institutes and the cleaning industry are interested in us because we have applied the way of thinking of "manufacturing "that had been developed in the Japanese manufacturing industry to the service industry and changed the cleaning business from the conventional product-out system to the market-in system. So the factories of Kikuya have various know-how and device so-called "company secrets". 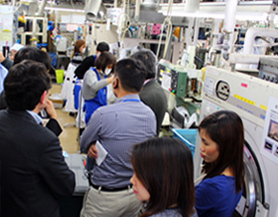 Generally companies give limitations and conditions for factory tour such as "we do not accept factory tour to prevent imitating" and "please do not take pictures or movies". 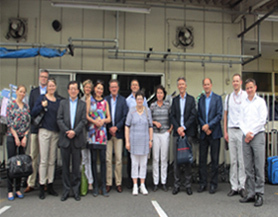 However, Kikuya has accepted requests for the factory tour from various industries and organizations. There are 3 reasons for that. By "showing", the consciousness of "better than now"arises in the company. 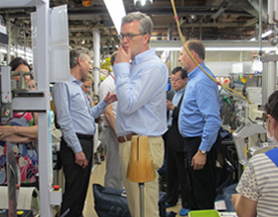 What Kikuya has learned through the "free tour" based on the 3 reasons is that "it became possible to listen to real dissatisfaction and anxiety against cleaning that customers have from the visitors".The motive and purpose of the factory tour is the contribution to the society, but it is connected to "various improvement of Kikuya", as a result. The below is the main contents of the factory tour (Approx. 1 hour). 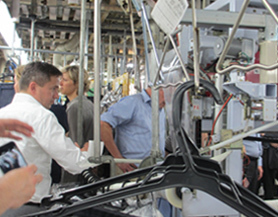 We have accepted inspection from more than 50 countries in Europe and America, Asia, South America and Far East etc.